WELCOME TO THE HUMANITIES GRADUATE STUDENT ASSOCIATION WEBPAGE! 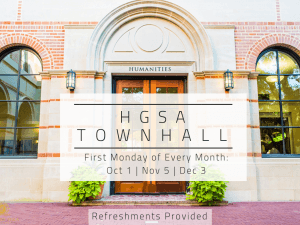 Join us on Monday, September 10, 6:30, for our first Fall Town Hall! We’ll see you in the Captain’s Lounge (next to Willy’s Pub in the RMC Basement) for dinner, an overview of the new HUMA Dean’s Fund, and a visit from Dean Canning herself to talk about V2C2 and the Strategic Plan! Remember: HGSA “last resort” funding applications due OCTOBER 1st! The Rice HGSA serves the graduate students of the Art History, English, History, Philosophy, and Religion departments. Our mission is threefold: (1) to facilitate open and honest communication between the Humanities graduate students and the staff, faculty, and Dean of Humanities regarding issues related to the School of Humanities; (2) to advocate for Humanities graduate student interests and wellbeing; and (3) to foster an inclusive community among the graduate student population of the Humanities. Thank you for visiting and check back frequently for updates!